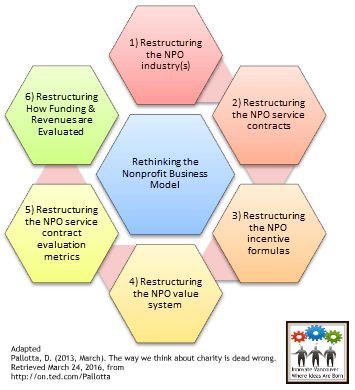 In a recent TED Talk, Pallotta contends that nonprofit business models should leverage the same business model tools and strategies as the for profit industry. The reasoning supporting this conclusion is that NPO’s need to become more competitive to recruit top talent, create competitive advantage, and generate additive values that are wanted by the customers (but often available in the individual NPO). Additive values, and ability, are ultimately provided by the entire not for profit industry. Sharing and coordination of resources becomes the norm. Ultimately no single NPO serves all the need categories belonging to any individual customer or homogeneous group of customers. The largest funder of NPO services is the government. The values based culture of NPO’s often espouses the belief that employees can be recruited, retained, and thus satisfied with the use of non-financial incentives. This often refers to 1) benefits and 2) holidays (which are financial but benchmarked with ‘competitors’ and so no advantage is leveraged), 3) relationships, 4) opportunities to grow, 5) opportunities for advancement, 6) opportunities to engage novel projects of interest, and 7) frequent celebrations surrounding their/teams successes. The challenge is that NPO’s are often plagued with the same non-functional attitudes, personalities, and behaviors seen in the for profit world while having the extra barrier(s) to discuss these non-functional characteristics: low salaries which traps the NPO to employing much more entry-level staff and rebuilding the NPO culture to align with (and thus become capable of supporting) the non-financial incentives. The reality that NPO services requires the inclusion of relationships with other NPO’s has created a culture of collaboration and coordination. The value additive mechanisms that are part of the competitive modeling for businesses is largely absent. When value is added to the industry it is often matched and benchmarked by adjacent NPO’s. These additive values in turn as included as explicit written, or non-explicit verbal, expectations of the public entity that is contracting with the NPO’s. Although NPO’s can compete through size and scope of services these rarely change as a result of internal forces. The opportunity for salary increases, and professional development, is often acquired through self-employment or at least moving on to the next company. The seven non-financial incentives listed in the paragraph above are then poorly leveraged by most NPO’s sufficient to gain employee loyalty let alone to recruit top talent. The collaboration and coordination conducted in the NPO industry is a necessity instead of a competitive advantage; because the individual NPO can espouse that their partnerships represent additive values unique to the NPO’s expertise they are common and required by service contract. The fact that the NPO’s industry, per individual sector, is largely homogeneous in regards to its business structure and competitive capacity creates a reinforcing mechanism that limits the development of the competencies necessary to consider being more competitive. This is not to say that competition does not exist; it does exist, both externally and internally. The problem is that it is often not a strategic competition that is planned, integrated, sustained, and leveraged by the revitalized NPO structures and systems. The competitive values achieved through these acts, if they truly represent additive values that are viewed as such by the customer, are thus poorly leveraged. The homogeneity of the NPO industry, per individual sector, also creates benchmarks for salaries, benefits, and administrative overhead. The result is that there is very little potential for profits to be allocated to the financial incentives that would beneficially impact employee development, recruitment, and retention. This homogeneity is also damaging to competitors in the NPO industries that are for-profit due to the lower benchmarks otherwise common in the industry. Even if profits are allowed these are not often allocated to financial incentives that impact the three employee metrics discussed earlier. A bonus may be provided but this does not offset the low salary; or another example, a bonus may be given but it does not offset the newly structured lower salary scales that are established to match existing industry benchmarks while simultaneously improving company profits. When there are changes in customers, or there is a loss of a customer to a competitor, it is more likely the result of an individual employee then it is of a competitive advantage that the other NPO retains. Other factors that influence customer retention is geography, new ‘needs’ being identified, dissatisfaction (not necessarily associated with any specific externality), changes in the family system, legal entanglements, etc. Although competitive advantage could be acquired by an individual NPO that develop a unique set of competencies to mitigate these risks it is unlikely that these competencies would be consistently or adequately leveraged within the existing industry structure. Within the current industry structure collaboration and coordination remains necessary for NPO’s to discuss risks and to address needs not served by existing service-lines. Having the ability to find solutions is not the same as being able to champion or implement the solutions. The industry structure leaves little reason for NPO’s to offer better financial incentives despite the fact that this decision negatively impacts the company’s competitive advantage. In the NPO sector competition, and advantages, are not viewed as desirable. 5) Restructuring the NPO service contract evaluation metrics (to include public incentives for delivering targeted outcomes,..i.e., referrals, etc.). At this current point the above solutions are beyond reach but they shouldn’t be. Many professionals working in the NPO industry(s) recognize and value the mechanisms that support both the agency and the customer; the challenge is to get NPO’s and the public oversight mechanisms to also recognize the employee. It would be rare in the current framework for an existing and satisfied customer to complain that the employees delivering their services, etc., are paid too much. They recognize the value of their services. This is more likely to occur when tax increases are proposed (that would affect non-customers) and when a potential customer is denied NPO services due to inadequate financial resources (or “slots” being available). When you take care of your employee you are also helping to take care of the customer. Everyone wins. This well-known fact, often dismissed or invalidated in public discourse (often through omission), must first change if the possibility of NPO’s to join competitive processes, practices, and systems is to be realized. This article originally appeared in Innovate Vancouver. This article was written by Travis Barker from Business2Community and was legally licensed through the NewsCred publisher network. Please direct all licensing questions to legal@newscred.com.